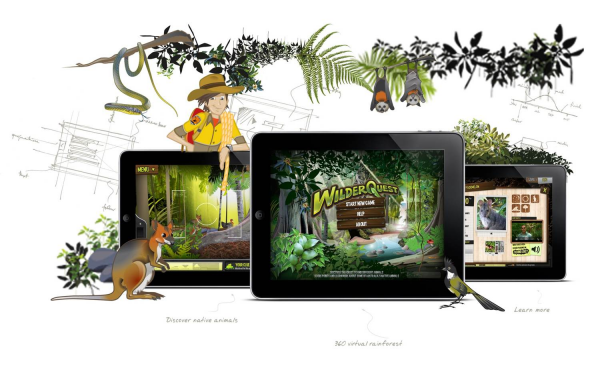 Nomad was engaged to develop an iPad app that engaged children in existing native animal education content. Nomad used existing content to immerse users in a virtual rainforest. Community feedback averages 4 ½ out of 5 star rating. 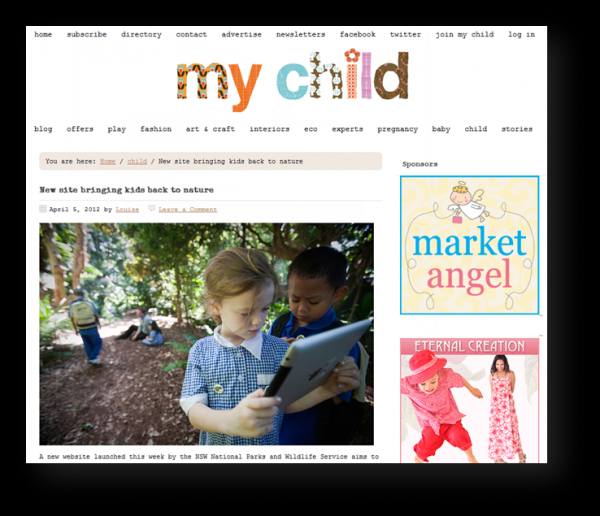 When NSW National Parks & Wildlife Society briefed us to use iPad’s to support a web campaign combating nature deficit disorder in children, the irony of using mobile technology was not lost on us. However, we’ve been developing mobile solutions for some time now with family focused partners like Nickelodeon and Taronga. The analytics show that kids are increasingly evolving beyond a shared PC and onto more personal and portable mobile and tablet devices. The NPWS PC site includes a range of educational games designed to encourage engagement with nature. The brief to Nomad was to evolve a Pac Man styled Flash game about Bower Birds into an iPad game. The objective centred on the requirement for children to playfully engage with the content to be inspired to engage with nature. NPWS were seeking a minimum of 5000 downloads in the first month of the campaign with any media attention for the app also driving users to the web version. •	We created a game that is instantly enjoyable to play for young and old and becomes increasinlgy educational through ongoing play. •	Nomad approached the brief through an exploration of the audience to gain a better understanding of where their iPad use intersected with the brand. •	Official census stats show that 50% of children between five and eight in NSW have limited access to natural spaces because they live in the greater Sydney metropolitan area while It’s estimated that more than 60% of children have regular access to a smartphone or tablet. •	When engaging with nature, children love the game of discovery. This includes the core elements of search, collection and scoring. •	We needed to create a solution that harnessed these discovery elements while presenting them a nature experience through technology, beyond actual natural spaces. •	A Pac Man style game as requested in the brief really wasn’t going to cut it. •	With a limited budget we also needed to work with as much of the NPWS existing design assets and content. •	Creating this solution within an iPad environment within a limited budget would require a focus on one core gaming interaction but to stand out against the “Angry Birds” games in the market, it needed to win childrens immediate attention while capitalising on the invaluable animal resource information that NPWS manages. Focusing on the core elements of search, collection and scoring, Nomad developed a solution that replicated where possible, children’s real world interactions in a rainforest. Nomad harnessed these discovery elements through an immersive 360 degree virtual environment that encourages kids to look around and discover the nature around them by holding the iPad like a camera. Panning around reveals more of the environment, 3D rainforest audio and hidden native animals. Upon opening the game, users are encouraged to collect animals by taking pictures of them to earn points and unlock more animals. Animals are hidden in their natural locations and clues about where to find them are available, furthering the education process. After using the app for a while, you really do find yourself looking a little closer at the undergrowth in the real world! Once animals photos are captured, users can open the animals page to reveal rich content as well as maps of local national parks and other animals you might find if you visit. The whole gaming process takes kids from a playful interaction to an educational experience and a gateway to actual national parks to extend the experience, engaging children with nature. There was no marketing budget for this project. The results however have far exceeded initial expectations of 5000 attaining 11,000 downloads within the first month already! Key to the high download figures was our successful management of the Apple editorial team to optimize our chance for high exposure. 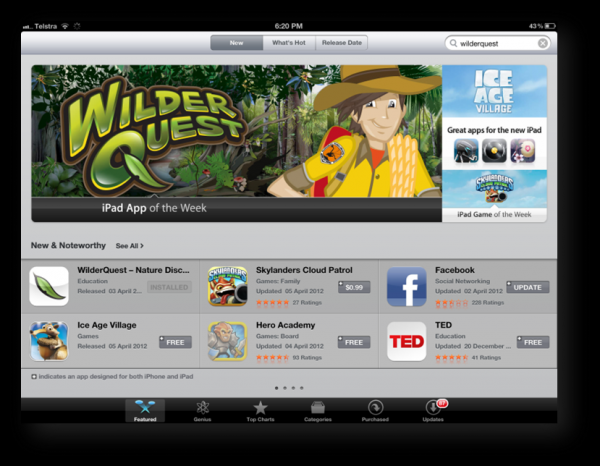 The app was featured as app of the week in the app store. And reached the number 1 position in its category. Being an Apple recommended product is a testament to the solution and a powerful driver for downloads. Reviews from users are very encouraging showing a rating 4 ½ out of 5 star rating and feedback that shows parents and children are enjoying the app for its gaming and educational value. Analytics are showing that the average user has returned to the app 4 times within the first month with an average 18 minutes per session equating to over an hour of interaction time per user. As an app that is primarily an educational tool about Australian nature, multiple interactions reaching over an hour per user in the first month indicates that the app has successfully answered the brief of engaging children in nature. This category relates to educational and family games developed for the mobile platform.